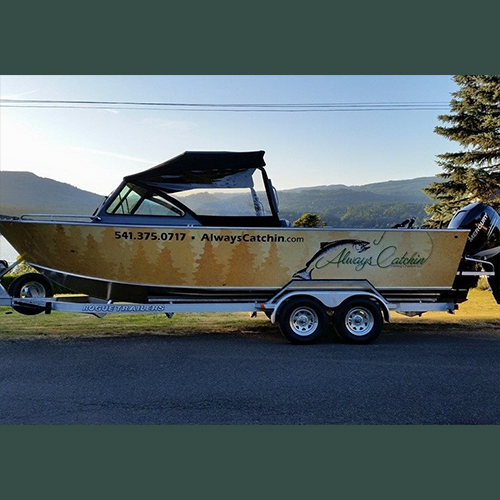 Always Catchin' is a fully license and insured Guide Service providing Salmon, Steelhead and Sturgeon fishing trips on the Columbia and Willamette Rivers year round, from Astoria to the John Day River. Guided Fishing Trips make great gifts and an excellent adventure for family and friends. Your Guide Jess Zerfing was born and raised in the small City of Cascade Locks, at the heart of the Columbia River Gorge which is known for great fishing. Jess grew up on the banks of the mighty Columbia River and knows it well. At the age of 11 he was fishing for Salmon on the banks of the Columbia River and spent most of his time doing just that. As Jess grew up he started looking at other fish this great river has to offer and at the age of 16 he started fishing for Sturgeon. He has caught many Sturgeons over 9 feet long before the age of 18. In the next 10 years of his life he would take many friends fishing and showed them the ture treasures of catching big fish. He loved watching people catch fish and the reactions they had when they caught their first salmon. He loved it so much that he decided to become a fishing guide and started his own business, Always Catchin’ Fishing Charters. Jess works closely with many big businesses in the gorge, such as Skamania Lodge. He was featured in a radio program that aired live from Skamania Lodge. Mr. Brian Wright, Co-Host for the Outdoor Guys (ESPN Hot Talk Radio 1510) from Kansas City went fishing with Jess and spoke all about his fishing trip live on the radio from Skamania Lodge.